Protein Microarrays can be based on any ligand-binding assay that relies on the formation of product with an immobilized capture molecule and a target molecule present in the solution. These assays can be miniturized and placed on a protein microarray chip. 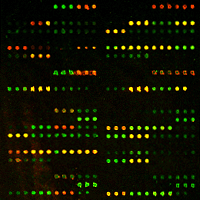 Protein microarrays are now becoming very popular due to their possible future applications in the study of nucleic acid-protein, protein-protein, ligand-receptor, drug-protein target, and enzyme-substrate interactions. Creative BioMart now offers customizable parallel synthesis and microfluidic technologies to create a microarray of thousands of peptides for binding to your protein or antibody sample and a comprehensive protein and/or antibody analysis service utilizing these high density peptide microarrays for high throughput detection, concentration titration, and screening applications.